2016 Florida Chapter of the American Society of Landscape Architects design award winning project. A village green sits at the heart of Nexus Sawgrass, a 23-acre pedestrian friendly rental community designed to inspire the residents to enjoy and explore the outdoor environment. The community is located in the City of Sunrise and provides its residents with a resort lifestyle. It is organized around a large open space, a village green. The village green forms the central core of the pedestrian circulation system, serving both as a destination and a connection point to all other activities throughout the development. The village green is anchored by a clubhouse building and a large pool deck. The clubhouse pool deck includes a large lagoon-like swimming pool with beach entry, café terrace, outdoor fireplace, summer kitchens, shade cabanas, trellis and lush tropical planting. The pool area connects to a large multi-use open lawn lined with shade trees, meandering walkways, picnic tables and coal fired barbeque grills. Provided landscape architecture and planning services for the entire project including master planning, conceptual design and site plan approvals. 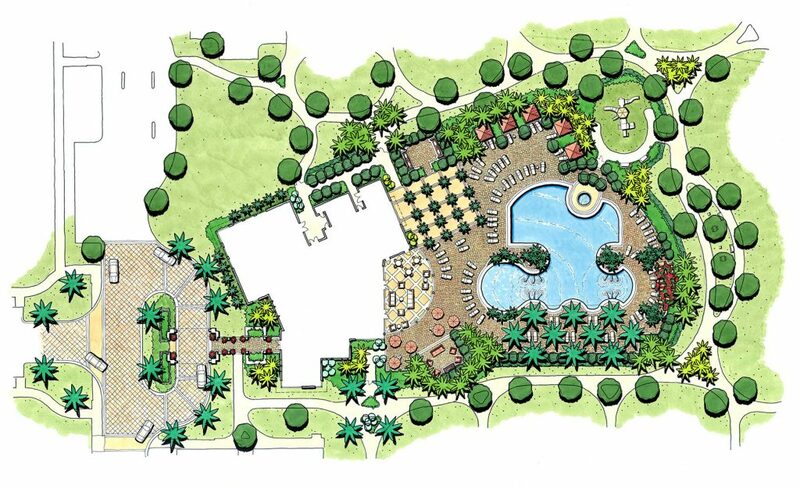 The design included streetscape, Village Green with clubhouse, beach-entry lagoon pool, spa, summer kitchens, cabanas and children play area. The Village Green is connected to a perimeter jogging trail and a fenced-in dog exercise area. The warp-around building features an interior courtyard with a free-form swimming pool and lush tropical planting.